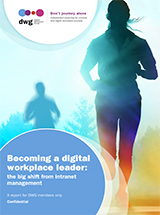 We are in the midst of a big shift from intranet management. Organizations are increasingly grappling with a potentially transformational wave of digital disruption. At the same time, awareness is also growing of the need to address the fragmented employee experience of digital tools that exists in most organizations. This backdrop represents an exciting, if challenging, opportunity for those in intranet and related professions to step up and lead in the digital world of work. In this briefing paper, we investigate this opportunity and how intranet professionals can leverage it to advance their careers and teams. We start by looking at intranet teams today and how they have evolved, then move on to gain a better understanding of new opportunities in the digital workplace space; the shape of the new roles and teams that are emerging; and how well intranet professionals are positioned to take these on.